In the dynamic, feverish world of entrepreneurs, there are very few indeed like Richard Branson. He’s brimming with British free spirit and chock full of big ideas. No, gigantic ideas. Long before American innovation superhero Elon Musk was out of nappies, Branson’s flair for dreaming and doing big was already in top gear. 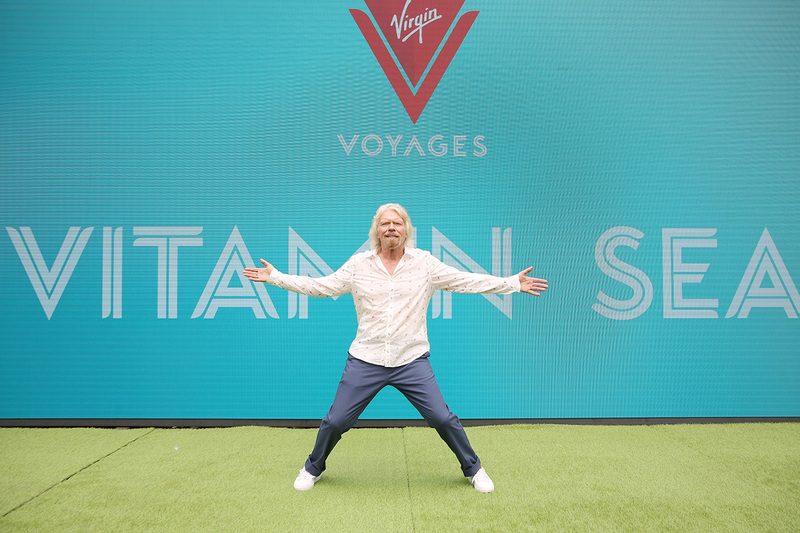 Fast forward to today and he’s focusing on Virgin Voyages, which Branson promises will change the face of ocean cruising as we know it. And he did it last week in style. 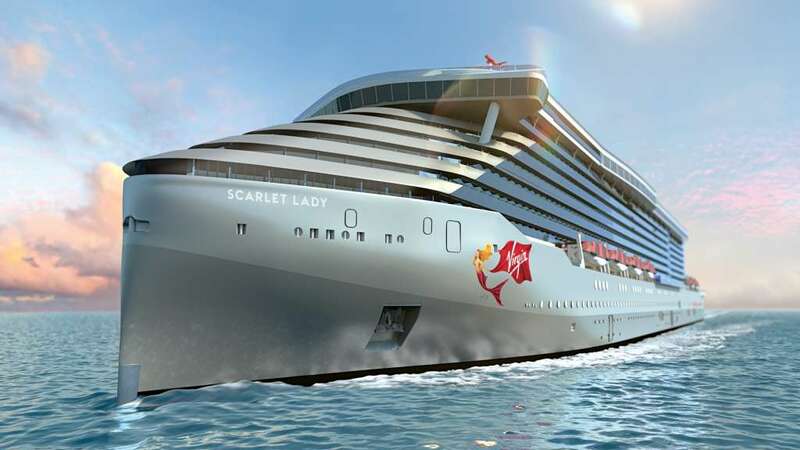 Scarlet Lady, Virgin Voyages’ first vessel for adults-only, will set sail in 2020. Nice, but hey, it’s just another cruise ship, right? One of several dozen coming out over the next few years as cruising continues to explode exponentially into the world of travel and leisure. Well, no, actually. Scarlet Lady is very different ­– and here’s why. The exterior of this ship is quite unlike anything we’ve seen before on a ship of this scale. It is so re-imagined from what a traditional cruiser looks like you’d be forgiven in thinking that it was part of a concept brief rather than a finished product. Her bow, for instance, has done away with the swooping clipper style favoured by centuries of ship designers for a vertical blade-like structure harking back to the warships of World War One. It’s a striking look and coupled with the raking decks that start immediately at the very tip of the bow, it will indeed be a look that turns heads and starts conversations. And that’s just the start. Scarlet Lady’s rear end is just as provocative. 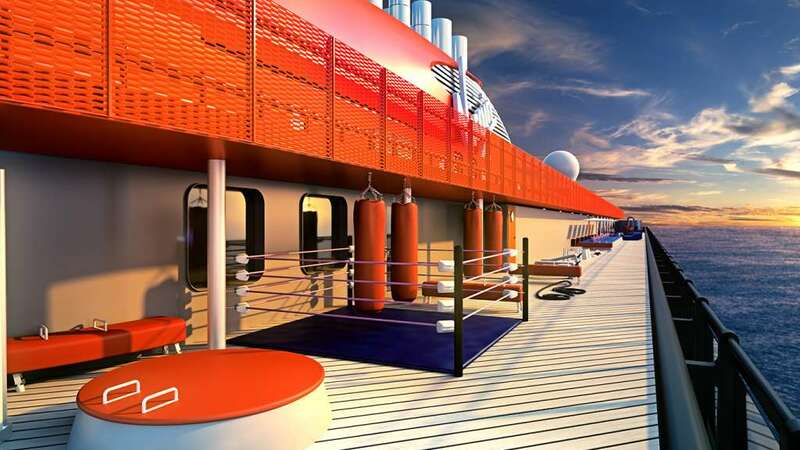 The circular-shaped Athletic Club is seated atop a column of suites rising from a low opened platform hull lavishly coated with seating and lounging areas, ensuring maximum deck space per passenger, or ‘sailor’ as Virgin would prefer you call them. The ship will hold more than 2,700 sailors and 1,150 crew, so for a luxury cruise ship, it really is a big one! Sir Richard and Virgin Voyages President and CEO, Tom McAlpin, announced that the company will be banning single-use plastics from all aspects of the voyage right from the outset to create one of the cleanest fleets at sea. This includes banning on board the use of straws, shopping bags, food packaging, bottles including bottled water and takeaway coffee cups, stirrers and condiment packets. Recycling and reusable materials will be used on the adults-only ship instead and complimentary filtered still and sparkling water will be available throughout the ship from bars and water stations. “We believe that in order to fulfil our purpose of creating an Epic Sea Change for All, we must make commitment that is bigger than just eliminating straws,” said McAlpin. 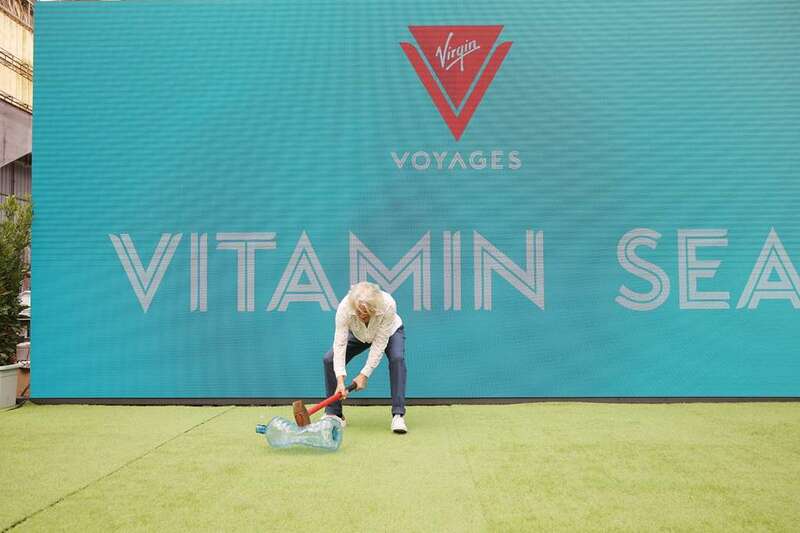 Virgin is placing healthy travel at the forefront of its cruising experience through its ‘Vitamin Sea’ ideology ­– creating spaces designed for well-being, relaxation and rejuvenation. The Athletic Club includes an outdoor training zone, an outdoor boxing ring, and a 1920s-themed New York sports club-style gym. If you prefer the more modern approach to fitness, the B-Complex will be full of resistance and cardio equipment incorporating the latest cutting-edge fitness technology. Phew, I’m exhausted just writing about it! Branson also launched the ‘Scarlet Squad’ program. This aims to recruit, support and mentor female shipboard talent and grow access to onboard leadership roles where historically there has been statistically few females. These roles include marine, technical and hotel management. “Across the maritime industry, we can do better in onboard recruiting and leadership representation for women,” said McAlpin.